In the late ’90s, female actors adorning the posters at my mother’s preferred beauty parlour were more compelling than the white girls with blonde highlights that now decorate salon doors. Among all the posters at Dadar’s pink-walled Simran Beauty Parlour, Bollywood actor Rekha held first chair. Her poster, a still from the film Khoon Bhari Maang (1988), was easily the largest one in the room and the most prominently displayed. She had the best eyeliner game I’ve ever seen this side of the country. Most ’90s kids in India grew up with parents who either loved, cursed or gloried in the light of Rekha. Urban legends about her being secretly married to actor Amitabh Bachchan did the rounds tirelessly. Aunties at weddings gossiped about her famed love life between unsolicited matchmaking activities. Their tones varied from shocked to mollified to admiring. Whatever their words, they all (openly or grudgingly) wanted to be Rekha. A generation later, I followed suit. But the Rekha I’ve grown to admire is very different from the one that was on parlour walls. The Rekha I love is flawed. Her soul has wrinkles. The women who didn’t grow up to her stunning work in Umrao Jaan (1981) and Ijaazat (1987) in the ’80s settle for being stunned by Rekha’s saris and gold jewellery today. But the admiration stretches far beyond the realms of her endless kanjivaram drapes. For the women of 2018, Rekha is an example of learning to stand on your own feet and dictating life on your own terms. She symbolises the strength it takes to fight a misogynistic industry that tried to tame her spirit. She rattled chairs in Bollywood that were reserved for men enjoying the throes of nepotism and oppression. All this, long before the #MeToo movement threatened to do the same last year. We often hear Rekha being referred to as the ‘ultimate diva’. But that’s a careless crown to give her. It pedestalises and therefore alienates her. It deprives modern women of everything they share with Rekha. Author and journalist Yasser Usman, who penned the biography, Rekha: An Untold Story, often points to Rekha’s honesty, her loneliness and her earnest confessions of unrequited love and heartbreak. She was never too proud to reveal her insecurities. In the book, he elaborates how a lot of her colleagues described her as ‘emotional, sensitive and free-spirited’. Haven’t women today been one or all of these at some point in our lives? Rekha’s on-screen debut began at the young age of 15. In her candid interview with Simi Garewal in 2004, she revealed how she had to start working early to support her family financially. With a single mom and siblings to educate, Rekha wore the mantle of responsibility on her tender shoulders. I particularly remember Rekha’s appearance in another Simi Garewal show in 1984, ironically titled It’s A Woman’s World. 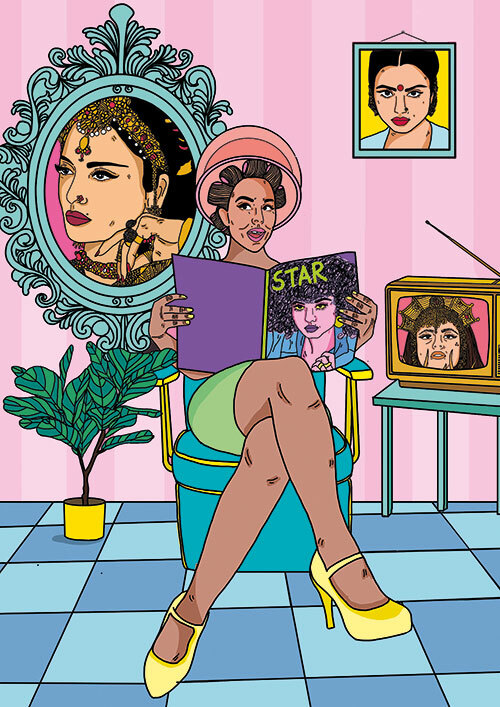 Ironical because Garewal’s idea of a woman’s world comprised only of beauty tips,’80s aerobics and a spaced-out astrologer Bejan Daruwalla predicting futures. Rekha had no plans to fit into it. When asked about how women can achieve a transformation in their appearance, Rekha was quick to question, “Why only appearance? Why can’t women achieve transformation in other things (sic)?” In the Rekha of 1984, I saw the women of today. I didn’t know which one to be in awe of first — the gumption or the casual hair flipping. During the initial days of her career, Rekha was chided for not being a ‘serious’ actor. She did several formula films and roles that earned her a reputation of being too ‘frivolous’. But she never really cared for the whisper network. In Rendezvous with Simi Garewal, Rekha expressed a sincere desire to have fun in her movies — awards and perception be damned. She comes across as a woman who doesn’t take herself too seriously and lives life with abandon. In It’s a Woman’s World, Rekha had talked about establishing financial and emotional independence above all. But that’s not the only reason women today admire her. Lawyer and writer Priya Alika Elias says, “I’ve seen her in interviews and I admire her courage! She looks so audacious, like she marches to the beat of her own drum rather than anybody else’s.” Elias is also vehemently on my side with her support for Rekha’s eyeliner game. There’s also something to be said about how she slides from one role to the other with buttery ease. I’d never seen a 60-year-old woman seduce anyone on the screen the way Rekha did in the song Kaisi Paheli Zindagani from the 2005 film Parineeta. Before that, she won women’s hearts with her role as Ramdulaari, a fearless midwife, in Lajja (2001). Every time Ramdulaari curses men for, you know, being men, women nod aggressively in the general direction of the TV. Meher Manda, a writer based in New York, notes that Rekha makes for a great interviewee. “She’s ruthlessly unapologetic about her sexuality and affairs,” adds Manda. This particularly reflects in Rendezvous with Simi Garewal. Even though Garewal wouldn’t stop reducing Rekha to the men in her life (father, lover, husband — you name it), Rekha answered with sincerity and confidence. She never flinched or refrained from calling out Garewal on her insinuations about the men she loved (or didn’t). But the love Rekha loves is almost bohemian. Whether it’s the supposed unrequited love she claims to feel for Bachchan or the tragic relationship she shared with her late husband Mukesh Aggarwal, Rekha holds on to sanity with love. In her interviews from her younger days to now, Rekha’s idea of romantic love is filled with conviction. A lot of women today would disagree with her extreme romanticism, the all-consuming nature of it. But whatever her path of romantic fulfilment, she remains unshakeable in her faith. She, like a lot of us, believes in being the greater fool in love. Her love may not conquer all, but it provides a beacon of hope for those who’ve heard all too often that they have no business believing in a world where love does not come packaged in societal permission. She’s had far from an easy life but has constantly claimed that she got lucky. Usman details in her biography how the entire film industry in the ’70s and the ’80s constantly tried to put her down. She was fat-shamed and dismissed for being too dark-skinned. But Rekha danced her way through her trials to claim sole agency over her life and decisions. In 2018, when women are striving to do the same, the persistence of Rekha is a symbol of a triumph that’s never too distant. Rekha’s freedom stems from her mind, the only place you really live.